Artist, Painter Draws Inspiration Close to Home, and "Down the Shore"
Kenneth Burde has been painting ever since he can remember. His mother used to keep his earlier drawings, which he says weren't very good at the time. Then he became a follower of Jon Gnagy's Learn to Draw TV program on Saturday mornings and started learning proper techniques. "I use the same method to teach my college students," says Burde. He is an adjunct professor of fine arts at Essex County College, but has taught at Belleville elementary schools for nineteen years, and for the last fourteen years has been teaching art classes at Belleville High School. Ken studied at The Art Students League and Parsons New School of Design, both in New York City. He is a graduate of the Newark School of Fine and Industrial Art, which he speaks highly of, and holds Graduate and Post-Graduate Degrees from New Jersey City University and Montclair State University, in fine arts and education. His website showcases his works, which include landscapes, downscapes, people and wildlife, still life and interiors, drawings and what he calls "down the Shore"-- as people in northern New Jersey refer to the beach. His landscapes are renditions of sceneries in Belleville, the neighboring towns and just about anywhere the muse strikes him. Downscapes, on the other hand, are aerial perspectives of certain locations (like a bird's-eye view or satellite images of coastal areas). These creative downscapes usually make it to juried shows, much to Burde's surprise. For the portraits, he makes it a point to know each person so the painting will reflect his or her character. Burde's down the Shore collection include paintings of docks, boats, sailboats and shorelines, inspired by views of Barnegat Bay from his own porch. He and his wife bought a bungalow by the bay, which serves as his quiet retreat. "That's how I get away from the dogs, the cats, everything. It's always very sunny down there. I just sit on the front porch and start painting. I like to paint mostly down the shore. 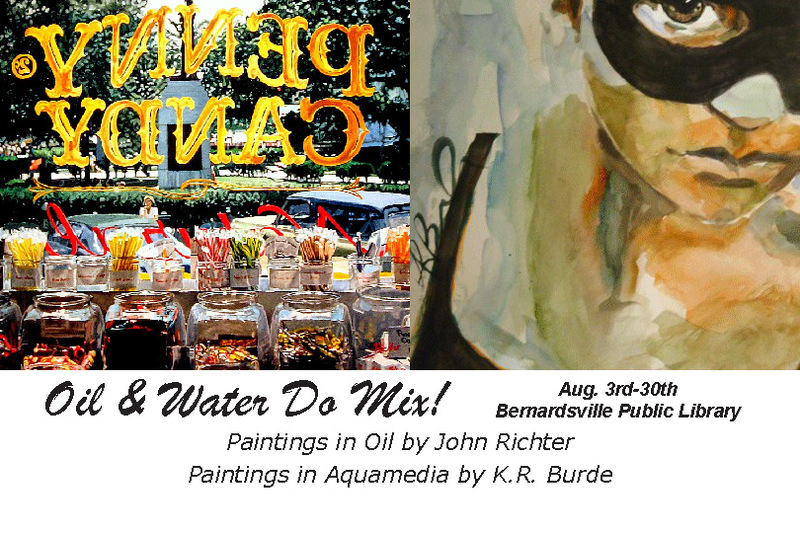 It's just an enjoyable thing to do," he adds.Burde was joined recently by another artist, John Richter, also a former Belleville resident, in a show entitled "Oil and Water Do Mix" at the Bernardsville Public Library in Bernardsville. The show, held in August, featured oil paintings by Richter and watercolor paintings by Burde. The artist also has several works in public display all over town. He painted the "Flag Drop Box" in front of Belleville Town Hall, the "Belleville Buccaneer" at Belleville Municipal Stadium, and the "Millenium Doors" of the Christ Episcopal Church. One of his most memorable public works, however, was an airbrushed mural at Belleville High School. According to Burde, the mural was inspired by the 9/11 events. "After not being able to join a friend in the recovery operations in New York, I wasn't able to sleep. I thought of the kids in school with their different cliques, and I just started drawing." The School Superintendent then gave him permission to use a wall to paint his mural. The result was a 9-by-30 foot-painting of an eagle, with the American flag as backdrop, and the words "One Nation United." "It's mostly a silent reminder to the kids that walk by to stop fighting over nothing," says Burde. Together with the other art teachers, Burde has also developed a college-type curriculum where the students could branch out into computer graphics, photography, sculpture or ceramics after the intro art classes. He encourages his students to learn and experience art, as "It reinforces what is taught in the other classes." He also makes it a point to share their resources with the elementary schools, as the latter have smaller budgets for their art classes. "Pretty soon we're going to start the 'fire poster contest' in conjunction with the fire department. We try to get the kids involved through youth art programs, poster design contests and school decorations." Burde, a lifelong resident of Belleville, has taught in the township school system for 34 years. Burde says he still maintains contact with his former students (even through Facebook). He even knows what careers they're into and who some of them went on to marry. "I miss them and I miss the time when they would just run up to me in the hallway to give me a big hug," reminisces Burde. opens the first week in August, at the Bernardsville Public Library, 1 Anderson Hill Road, Bernardsville. It features original watercolor paintings by Kenneth Burde and oil paintings by John Richter. The show runs through August. Call the library at 908-766-0118. An opening reception will be hosted by the artists from 11:30 a.m. to 1:30 p.m. on Saturday, Aug. 14. The public is invited and refreshments will be served. Exhibit hours are Mondays to Saturdays, during the library’s summer hours. K.R. Burde has been painting in and around New Jersey for more than 40 years and is an associate member of the National Watercolor Society, NJ Watercolor Society, Allied Artists of America, the Monmouth County Arts Council, the Newark Arts Council, the City Without Walls Gallery and has won many awards in regional and national shows. Burde is a graduate of the Newark School of Fine & Industrial Art, and holds graduate, and post- graduate degrees from Jersey City State College, and Montclair State University. He has been teaching art in the Belleville School District for over 30 years, and is an adjunct professor of art at Essex County College. He has been included in Who’s Who of American Artists, as well as, Who’s Who of American Educators and his work can be seen online at krburde.com. Newark native John Richter began painting traditional realistic paintings and landscapes over 35 years ago. His work has been exhibited in juried shows in New York and New Jersey, including Ridgewood Art Institute, 2010, 30th Annual, Bernardsville Library Annual Juried Shows, 2010, 2009, American Artists Professional League 80th Grand National (2008 Award Winner,) Monmouth County, NJ Arts Council (2009 Award Winner,) Allied Artists of America 94th Annual, 2007, Somerset Art Association (2008 Award Winner,) Knickerbocker Artists of America (1979 Award Winner,) Westfield Art Association, and The Art Centre of New Jersey among others. Says Richter, “I use vibrant, colorful pigments in my city/landscapes enabling me to bring out special plays of light and shadows, or simply incorporating a brilliant mid-day sunshine to ignite everyday scenes.”Basically a self-educated painter, he studied briefly with Miriam Burrill, AAPL, at The Art Centre of New Jersey, (where he served as a past President,) and with Al Hansen at Rutgers University in Newark where he graduated in 1974 with a BS Degree. Some of Mr. Richter’s works are held in private collections in New Jersey, Florida, and France. METRO 26," juried by Chris Coover (Christie’s and Antiques Roadshow), Kathleen Gilrain (Smack Mellon) and Priska C. Juschka (Priska C. Juschka Fine Art), has its opening reception on Saturday, February 7, 2009 from 6-8pm at City Without Walls. This exhibition is cWOW's twenty-sixth annual juried travelling exhibition featuring small works by artists from the entire metro region. Show dates and location: February 7 - May 1, 2009 at cWOW, 6 Crawford Street, Newark, NJ. Free and open to the public Thursdays through Saturdays 12-6pm. METRO 26 travels throughout the State of New Jersey for the subsequent twelve months. Monmouth County Arts Council's 30th Annual Juried Art Show and Sale is under way at the Monmouth Museum in Lincroft. International artist Frank Hyder served as the juror for the show, which features some of the finest artists from New Jersey and the East Coast. Among the pieces on view through March 1 are "Burgundy Landscape" by John Richter of Branchburg, "Twisted" by Erik Johanson of Tinton Falls, "Whaler's Cabin" by Michael Hynes of Middletown and "Black Eyed Susans" by Belleville artist Kenneth Burde.The annual show and sale is organized by the county arts agency, which is dedicated to fostering the growth of arts in the community. The museum is located on the campus of Brookdale Community College. Juried by Heather Darcy (Mixed Greens Gallery), Erin Donnelly (Lower Manhattan Cultural Council), and Carlo McCormick (Paper Magazine), METRO 25's opening reception will be on Thursday, November 15, 2007, 6-8pm at City Without Walls. The exhibition marks the 25th anniversary of cWOW’s juried travelling small works show. Show dates and location: November 15 – December 20 at cWOW, 6 Crawford Street, Newark, NJ. Free and open to the public Wednesday through Friday 12-6pm and Saturday 1-6pm. The show travels throughout New Jersey during 2008. Featured Artists: Katherine Sullivan, Francesca Azzara, Elizabeth Mead, Andrea Morganstern, Danielle Auriemma-D Amico, Will Suarez, Ali Soltani, Kelly Vetter, Michael Teters, Vikki Michalios, Oliver Diaz, Matthew Ortega, Marco Munoz, Beth Gilfilen, Gene Wisniewski, Patricia Bender, Alyssa Fanning, Joan M. Palmer, Jason Watson, Jym Paris, Sherry Shine, Colleen Gutwein, Rachel Beach, Jay Seldin, Joe Waks, Anne Dushanko Dobek, Firth Macmillan, E. Jan Kounitz, Jo Bradney, Amy Hill, Patricia F. Cleary, Dan Zomack, Nyugen E. Smith, Werner Foster, Mansa Pryor, David Sutton III, Larry McKim, Kenneth Burde, Gina Bellando, Aliza Augustine, Mark R. Wojcik, Aimee Hertog, Joan Sonnenfeld, David Vega, Tony Zaza, Debra Weber, Francine LeClercq, Cortney Burke, Robert McCormack, Carlo Vialu, Kentaro Hiramatsu, Anker West, Neal Korn and Edward C. Long MAY 18, 2006 - NY Times NOVEMBER 8, 2007: METRO 24 City Without Walls unveils METRO 24 in its newly renovated main exhibition space on Crawford Street, featuring more than fifty small works by dozens of artists from Newark and New York metro area. Jurors Mary Birmingham, who teaches art history at Montclair State University, and Dr. Marguerite Mayhall, assistant professor of art history at Kean University, selected the works on display from hundreds of submissions, and awarded special prizes to three artists. METRO 24 is cWOW's twenty-fourth consecutive annual small works show, which, under the direction of Metro Show Coordinator Teri Wester, travels on to more than a dozen venues throughout the state of New Jersey. Open and free to the public at cWOW's Crawford Street Gallery, Wed-Fri 12-6pm Sat 1-6pm. Featured Artists: Brian Bednarek, Gina Bellando, Patricia Bender, Charles Bentz, Joann Boscarino, Joseph Boss, Ruth Brown, Cecile Brunswick, Kenneth Burde, Cortney Burke, Andrew Casano, Robin Cross-Keller, Jane Dell, Jessica Demcsak, Ron Dill, Sonoko Fagans, Lori Field, Claudia Flynn, Samuel G. Forlenza, Danielle Frankenthal, Asha Ganpat, Vallerie Gillet, Grigory Gurevich, Robin LM Jordan, Owen Kanzler, Ilona Kennedy, Marco Muñoz, Diego Neto, Antony Nicoli, William Randolph Oliwa, Alexandra Pacula, Jym Paris, Pico Reinoso, Steve Rossi, Christina Soto, Vanessa Van Kuren, Kelly Vetter, Debbie Webber, Troy West, Jesse Wright, and Dan Zomack. More than 400 entries from a broad spectrum of local, regional and national artists were received for the 28th Annual Monmouth County Arts Council (MCAC) Juried Art Show & Sale. Ninety-one works in a variety of mediums including paintings, works on paper, 3-D works, mixed-media and photography, were culled from the entries by juror Bruce Waldman, a printmaker and illustrator. The 2007 juried art exhibition is on display through March 4 at the Monmouth Museum, on the Brookdale Community College campus in Lincroft. During an opening reception Jan. 27, $250 awards were presented to five artists, and eight artists were recognized with honorable mentions. Karen Starrett Belfer, of Ocean Township, received an award for her mixed-media piece "Remission Depression." Belfer is a mixed-media artist and painter, certified art teacher, graphic designer, art director and community volunteer. *Kenneth R. Burde, of Belleville, received an award for his acrylic painting "Downscape 41 - Bad Landing on the Island." Burde's downscapes are geographic relief studies based on satellite images of American cities and rural areas.